The new album You Don't Own Me Anymore available now! Click here to purchase. The Damage: The Story Behind "You Don't Own Me Anymore"
There are two ways of handling a dangerous, raging river: you can surrender and let it carry you away, or you can swim against the flow. 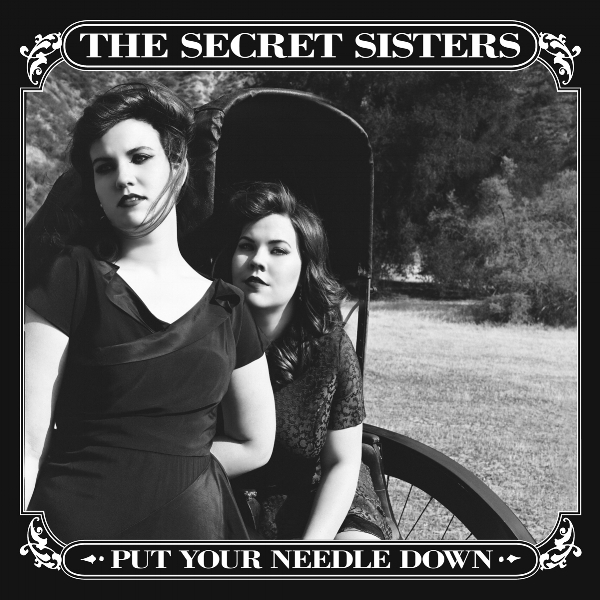 For The Secret Sisters, there was a point after the release of their last record when they could have chosen to do neither – instead, sinking to the bottom as the weight of the world washed away their dreams. They went from touring with Bob Dylan to losing their label, purging their team, filing bankruptcy and almost permanently trading harmonies for housecleaning. But there's a mythical pull to music that kept sisters Laura and Lydia Rogers moving forward, and they came out with a biting and beautiful third LP, produced by Brandi Carlile, You Don't Own Me Anymore. Their first as New West signees, it's a document of hardship and redemption, of pushing forward when it would be so much easier to drown in grief. And it's a story about how passion and pure artistry can be the strongest sort of salvation – how art is left, like perfect grains of sand, when everything else has washed away. "We are more proud of these songs than we have ever been," says Laura. "Some of the songs are a little more cryptic, but some of them are very pointed and honest and direct. And we had to let those songs happen. We had to let ourselves be angry again, and bring up things we wanted to forget." It certainly would have been easier to just try and forget the past few years of The Secret Sisters' life. After their second album, Put Your Needle Down, didn't perform according to their label's expectations – however unrealistic they were in this day and age – the duo was dropped, leaving them with barely enough money to stay on the road and keep making music. So they retreated home to Alabama, worn and weary from experiencing the devilish side of the industry first-hand, scraping together whatever they could while trying to embrace what seemed to be a future without music. But when Carlile – someone whom The Secret Sisters have admired for years and one of our truest talents – offered to produce their record, it made them think that a future was possible. Soon, a PledgeMusic campaign that completely exceeded their hopes and dreams made it fiscally so. "It was a nightmare that every day seemed to worsen," says Laura. "We went through things we literally never thought we would come out of. "Adds Lydia, "it had just gotten so bad, the only option was to file bankruptcy." Even once Carlile gave The Secret Sisters some renewed hope, things weren’t instantly easy: what they went through left huge, gaping wounds that needed to heal before they could pour themselves into songwriting. But when they did, everything changed. Laura and Lydia found themselves in a more creative and honest space than ever, with their experiences flowing and morphing into collective tales of triumph, rage and the indefatigable human spirit. The resulting songs of You Don't Own Me Anymore are about life when everything you think defines you is stripped away: from "The Damage," as gorgeous as it is haunting, that speaks directly to those that did them wrong, to the first single "Tennessee River Runs Low," that imagines the willful flow of a powerful river. These are journeys as poetic as they are confessional, always anchored by the timeless, crystalline ring of Laura and Lydia's voices in sweet unison. "This record is deeply personal because of what we endured," says Lydia. "But it's important as a songwriter and artist to talk about the times things weren’t great. This is a hard business, and it's not all roses and rainbows. What we came out with is more honest than ever, and we couldn't help that a lot of it is about the darkness." In the beginning, before that darkness moved in, things were a little like rainbows and roses for the sisters, who rose quickly through the music universe. An open audition in Nashville in 2009 lead them to a major label deal and a debut record produced by T Bone Burnett and Dave Cobb, followed by a tour with Levon Helm and Ray LaMontagne, a feat for any artist, let alone two that had just gotten started. From there, they opened for the likes of Dylan, Willie Nelson and Paul Simon, appeared on numerous late night shows and released a second album with Burnett. But the tides turned quickly – things can change in an instant, both for the good, and the bad. And when the clouds started to lift, Carlile was there to help usher in the sunshine. "Brandi, Phil, and Tim had never produced a record for anybody but themselves," says Laura about their experience in the studio. "We are all artists, and we could include our opinions. I felt like everyone was an equal force in the room. It is often lost on producers that you actually have to go perform your song on a stage - it's easy to get so caught up on the production that you don't discuss how this all will translate - but Brandi innately understood that." The end product finds the sisters taking their music to new places, with soulful, gospel grooves and stirring vocal deliveries that never seek perfection over power. From murder ballads to skewering roasts, it's a guidebook for survival. After all, sometimes you have to lose everything to get a renewed version in return. Like the Tennessee River they sing about, only after a drought does fresh, new water come rushing in. The same could be said for The Secret Sisters, who were scraped dry and put through hell, coming out with their finest record, You Don't Own Me Anymore. "The only way we could have completely healed was to have written an entire record," says Laura. "I think we were just in the wrong parts of the machine," says her sister. "We feel like we have learned where not to be, and where to go." And that's to never let anyone or anything own them again. Sign up for The Secret Sisters' email list here! Never miss an update or a concert announcement again!